Cell Tower Lease Rates | How Much Rent & Why? Why Consider a Cell Tower Lease Buyout? What is the value of my Cell Tower Lease? What Do Our Services Cost? Black Dot – Who Are They? Lyle Company – Who Are They? Property Owners have become accustomed to relying on market rents in their respective areas to determine potential cell tower rents when leasing land cell tower companies. This practice can cost a property owner hundreds of dollars over the life of a cell tower lease. Many assume cell towers are real estate assets, however, cell tower companies assess them as telecom assets, and so should all property owners leasing their land for telecom placement. These companies willingly divulge markets cell tower rents in a property owner’s area because it is beneficial for them when you rely on those numbers. Know every cell tower has different value and that you should base potential cell tower rent on the telecom’s need of your land, not on rents being paid around you. Remember, the telecom companies have experts working for them, shouldn’t you? Choose one:I have been asked to extend my current cell site lease.I have been approached to sell my cell site lease.Other industry services. What Services Do We Offer? How Do We Get Our Results? We will review your lease or buyout offer for free. If we can help, we will tell you exactly how. We have negotiated over $465,000,000 in cell tower rent. Complete the form below to start now. Cell tower leases — how much rent & why? Should I sell my cell tower lease? Should I renew my cell tower lease? What are the going rates for cell towers? How much do consultation services cost? Schools – Cell Tower Companies Last Resort? Vertical Consultants was more than our consultant they were an advocate. We are extremely satisfied. Vertical Consultants took on Sprint for us. Sprint didn't know what hit them. We own an ice cream company. Over a 300% increase in rents was a sweet result. Thanks Vertical Consultants. Our company has cell lease across the country. Vertical Consultants continues to impress us with their results. Vertical Consultants got our company 664% more cell tower rent. Results matter. 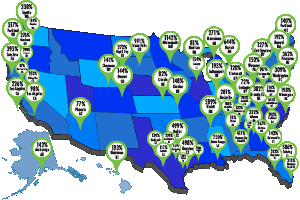 FREE report, see the rent rates for towers near you. Enter your details in the form below for a free review of your cell tower lease or offer. I have been asked to extend my current cell site lease.I have been approached to sell my lease.Other industry services. Enter your contact information below. I inherited property from my grandmother that had a cell tower on it. The cell tower had been on my grandmother’s property since 1995 and a money-grabber went out to her property when she was 80-something years old and cut her rent down to half of what she was getting. He threatened she could lose the tower if she didn’t take the reduced rent. After I inherited the lease, With 6 years left on the contract, I knew I had to be proactive about getting a better deal. I reached out to a few different cell tower lease companies to find out what was possible in my situation. The other companies were saying that I may or may not be able to negotiate a deal and didn’t really seem interested in trying to help. Vertical Consultants was different and they were ready and encouraged me to get representation. I actually spoke with Hugh Odom not just an employee. We ended up with 3 times more rent and now get a yearly increase. Vertical Consultants also negotiated that if someone else is added to the tower, I get compensated. My grandmother didn’t have that on her lease and missed out on extra income. Working with Vertical Consultants was a very positive experience. The best thing is that I got representation. They are there for me to protect my interests or if I have any questions. We will review your lease for free. No strings attached.